How to Play the Card Game Oh Hell! One of the main variations on the card game Oh Hell! is called Romanian Whist, for the surprisingly good reason that it comes from Romania. In fact, the game is called plain old Whist in that country. At least three players: You can play with up to eight players. One standard deck of 52 cards: At the start of the game, pare down the deck so you have eight cards per player in the deck, using only the highest-ranking cards. For three players, prepare the deck so it has only the aces through 9s in it; in other words, a 24-card deck. If you have six players, use a 48-card deck. With seven or eight players, you play a six-card game. Paper and pencil for scoring: You may want to construct a score sheet set out in columns, with a column for each player. You cut the deck to determine the dealer. The dealer gives each player the appropriate number of cards, dealing clockwise. The appropriate number depends on what stage of the game you’re currently in. Romanian Whist differs from Oh Hell! in that you start with one card for the first trick, work your way up to eight cards, and then work your way down again. But the differences don’t end there. The progression of Romanian Whist is a rather labored one because instead of going up one card at a time, every player takes a turn to deal a hand with one card each (thereby eliminating the dealer disadvantage). After each one-card trick, the deal progresses normally until you get to the round of eight cards. At that point, everyone takes a turn at dealing eight cards, and then the progression retreats back down to one again for another complete round. Determine the trump suit by turning over the top card of the undealt-card pile. When you play the eight-card round, you play the hands with no trump suit at all. All the normal Oh Hell! rules apply to the bidding and to the playing of the tricks — with one exception. The exception is that at Romanian Whist you are forced to play a card from the trump suit if you have no cards in the suit led. In Oh Hell!, you can discard anything you like; if you have no trumps, you can throw anything you like. If you make your contract, you score 5 points, plus 1 point for each of the tricks you take. If you take fewer tricks than you contract for, you lose the value of your bid. If you take more tricks than you bid for, you lose the value equivalent to the tricks you took. The scoring routine sounds complicated, but it really isn’t. Look at how the scoring may apply to the four-handed game shown here. Each player has three cards, and clubs are trump. North player deals. With clubs as the trump suit, the bidding and scoring for this hand may get ugly! East bids zero, South bids one, West bids one, and North bids zero — rather unhappily. A bid of two by the dealer is a valid option here, but the diamond suit just seems too unlikely to generate two tricks (hey, you can see the other players’ cards — North can’t!). East leads the 4 of spades, and South plays the 10 of spades. West wins the trick with the J of spades, and North discards the 9 of diamonds. 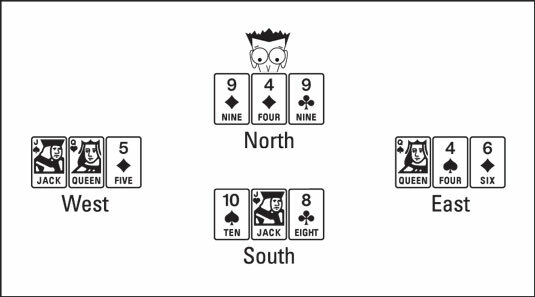 For the second trick, West leads the 5 of diamonds, North plays the 4 of diamonds, and East plays the 6 of diamonds, which creates a problem for South. If South trumps this trick and leads the jack of hearts, the lead may well win the last trick. Because discarding brings the bonus of defeating East’s contract, South throws away the jack of hearts, giving East an unwanted trick. North wins the last trick with the 9 of clubs, the highest trump card left. West nails the bid of 1 and scores 6 points. East underbid and loses the single trick, or 1 point. South overbid by one trick and loses 1 point. North underbid and loses 1 point. One highly entertaining variation to the last one-card hand is to hold your card on your forehead so everyone but you can see your card. You have to make your bid in the usual fashion, without knowing your card, based on the bids that everyone else makes and the cards you can see.